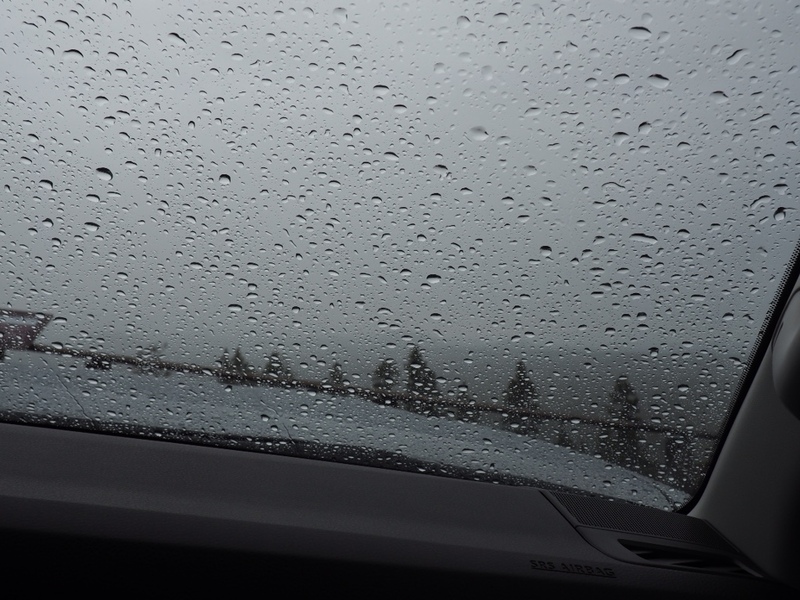 The skies opened up as we parked atop Lava Butte - our first stop of the day. This was not what we had in mind when we scheduled four days at Tumalo State Park, just north of Bend, Oregon. However, with so much to see and do, we headed out early and hoped the weather report, which called for just a 30% chance of afternoon showers, would be accurate. Silly us! We would have preferred sunshine, but the view wasn't bad for such a cloudy day. 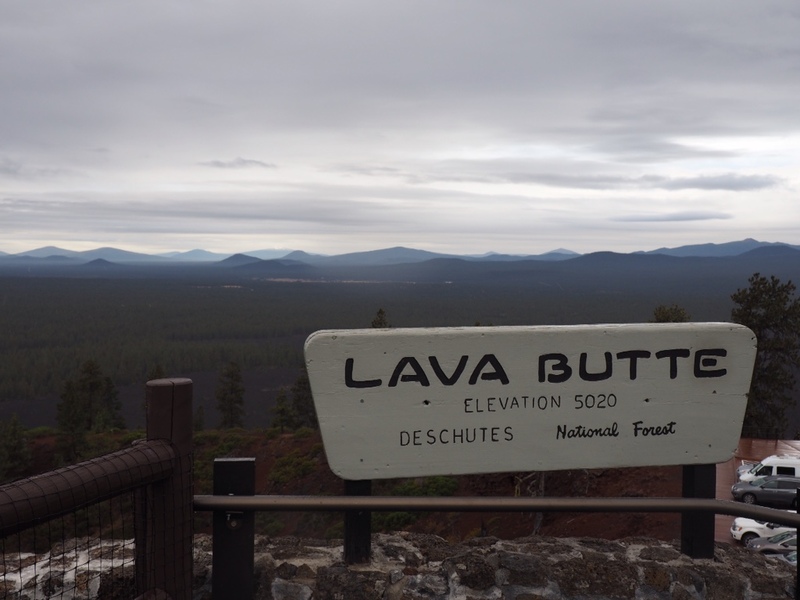 Lava Butte is located within the boundaries of Newberry National Volcanic Monument. 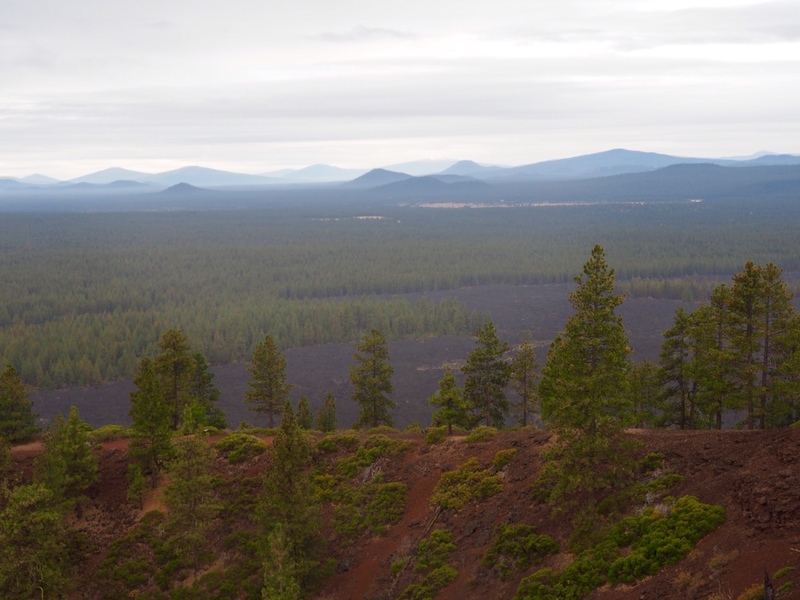 The monument was created in 1990 to protect more than 54,000 acres of lakes, lava flows and spectacular geologic features, remnants of long past volcanic activity in Central Oregon. The butte was our first stop on a rainy morning, a morning that got progressively brighter as we continued to explore. A narrow road spirals around the butte where ten parking spots are located. Visitors are assigned a time slot and given 30 minutes to spend up top. Even with gray skies, the view was pretty amazing. Lava fields extend for miles. 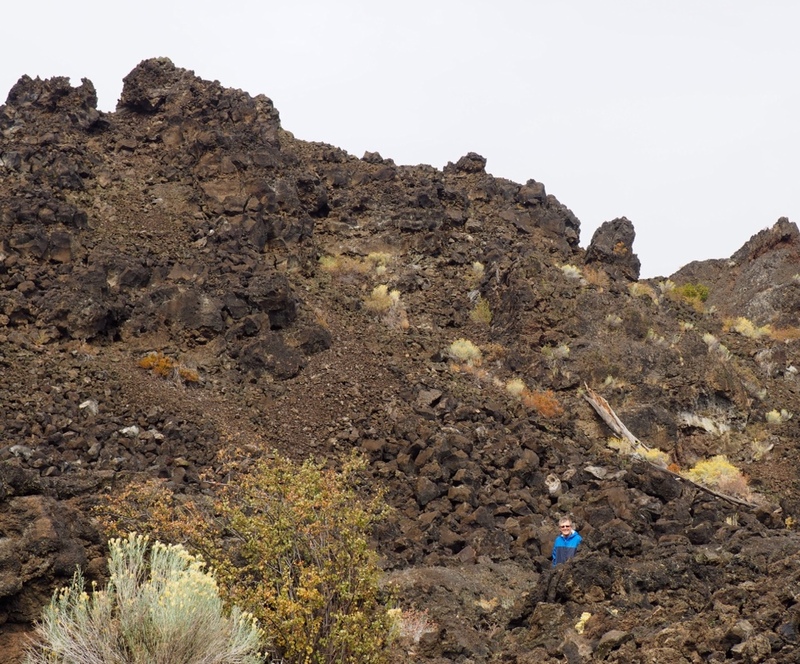 A pathway from the Visitor's Center led us up, down and around the ancient piles of lava. A series of stairs, ramps and railings led us into the cave, but they soon disappeared and we were left with just our flashlights to guide us. It didn't take long before the light dimmed, then disappeared completely. Flashlights are a must! 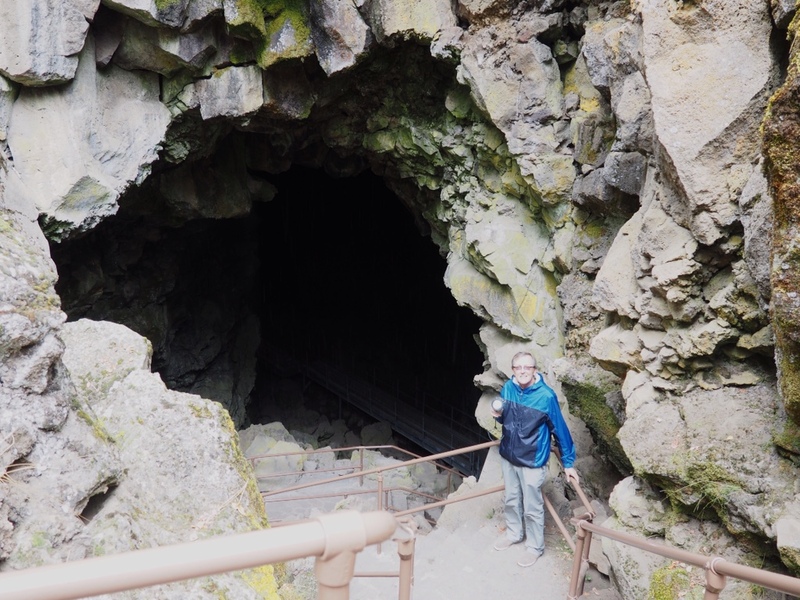 One of the more unique adventures we discovered at Newberry Volcanic National Park was the walk through the Lava River Cave. 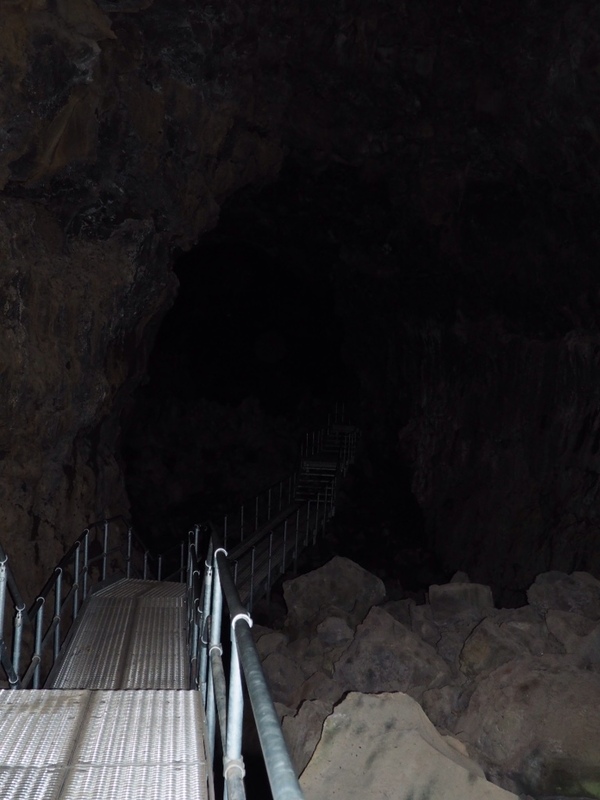 Surprisingly, this is a self-guided walk through a pitch black lava tube. We were told the path extended a mile into the cave. Reg exchanged his car keys (for collateral) and ten dollars for two park service flashlights – you can bring your own but make sure the batteries are good and strong! We were educated about bats…although, lucky for me, we didn't see any…and sent on our way. I've must admit…we didn't walk the entire way to the back of the cave, so I can't tell you what lies at the end of the trail. There weren't many other brave souls making the journey that day and I started getting the the heebie-jeebies. So…my suggestion to you would be that you plan your own visit sometime soon and find out for yourself what's found the end of the trail…then let me know! Maybe there weren’t any bats because they were ou getting ready for October 31st! We have been to the end of the tube. It is a long ways made even longer with just torches. I kept hoping for a change of scenery once we started down the tube, but after awhile it just got creepy! We are great big chickens!! !